Home Gaming review Beat Cop | Nintendo Switch Review. 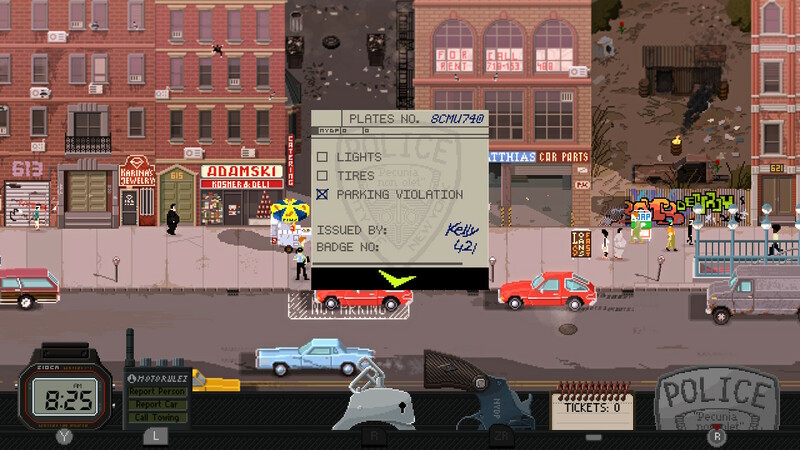 Beat Cop is one of those games that takes you back in time specifically to the '80s although I was born at the end of the 80's I still very much love the era and appreciate the aesthetic, being a pixel style game that is set in the '80s makes it that much more pleasing to me. 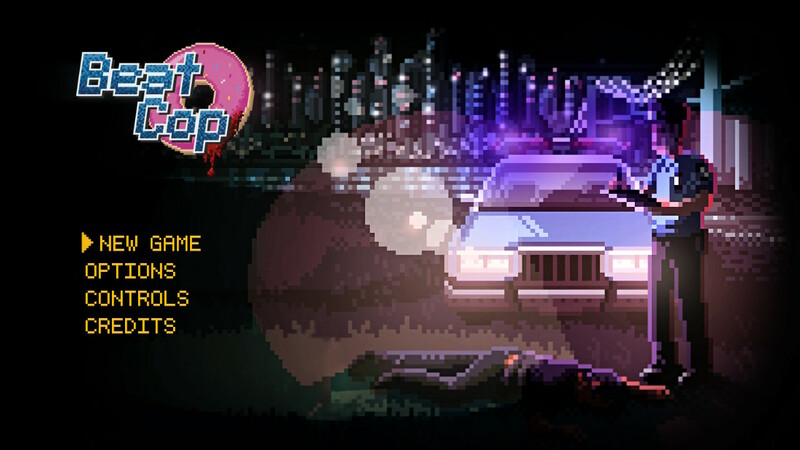 Beat Cop started out as a PC game back in 2017 and has since been released on various platforms, I was given the chance to play it on Nintendo Switch and was looking forward to getting stuck in. The game was developed by an Indie game development studio called Pixel Crow, they develop pixel style games on different platforms, the pixel art style is their chosen style and it works well in their favour making their game stand out. You take on the role as a patrolman named Jack Kelly, you're given daily tasks to accomplish some of which I got lazy with and didn't end up doing because it was a race against the clock to get things done within your shifts. You must write tickets, arrest people, respond to any calls that have come in, try to keep the peace in the area all whilst trying to make sure the local crew and mafia don't try and take you out. What I liked about this is that you can balance it out and make sure the police, crew, and mafia all like you or you can go down a rocky road and let the trust people have in you drop. The tasks you take on can have a big effect on how the game will pan out for you, it cleverly lets your failures either be a good thing or bad thing same with your accomplishments, you could have a call come in about a robbery and chasing down a criminal only to realise you made a deal with them to protect them so they could get away. The more deals you make with the mafia and crew the more chance there is of you becoming a dirty copy but at the same time, you're just trying to survive each shift with the hops no one will put a hit out on you. The mafia and crew hate each other so I would find myself in a sticky situation where I could either help the mafia and betray the crew or help the crew and betray the mafia, this obviously is something that won't go down well back at the station. I constantly felt under pressure whilst playing Beat Cop but this made me want to see what the outcome for me would be, at times I was given tasks that were timed and if they weren't completed within that time it would have a negative effect on the whole game. 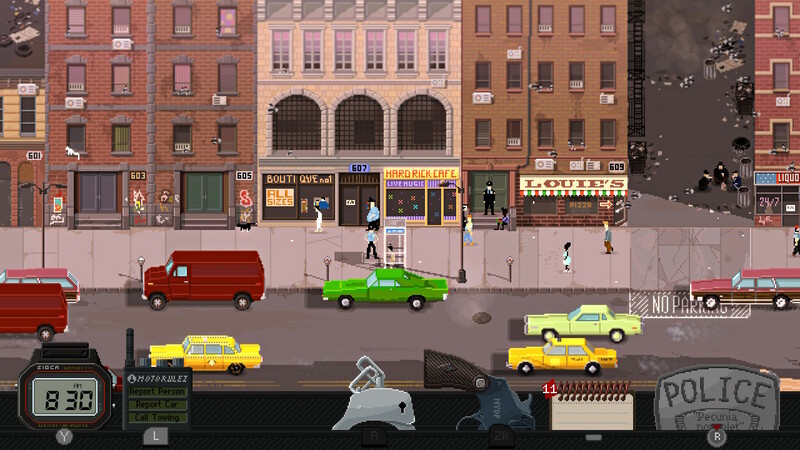 It was a constant battle and I was a terrible cop, I was rubbish at keeping up with criminals running away that I had to catch and rubbish at solving puzzles in cars to try and find hidden drugs but luckily the game comes with the option to go back in time and replay that day to try and do better, I gave this option a go many times when I was stuck and kept being greeted with the GAME OVER screen. Making friends and helping others besides the mafia and crew is a good way to get people to open up to you when you need to get information, hell you could even sleep with prostitutes in this game which comes up with the dialogue to what's being said whilst it happens. Although the days go by fast in the game I also felt that by the time you got instructions of where a criminal was, you're not given enough time to try and catch up especially if you're at the furthest end of the street to them. At times if you didn't get something done within that day the game will end early for you forcing you to go back to try and work out what went wrong, this is pretty cool because it gives the game more playability and multiple endings. The button layout is fairly simple, I did find myself pressing A to try to run faster as I'm still not used to using the Switch yet, I only got it recently, the screen shows you buttons you need to press anyways so you don't have to keep going into a menu to try to find out, I like that it shows the content of what you're carrying on you on the bottom of the screen so it's in the foreground reminding you what you need to check and use for the tasks you have been given. There is also an element of humour which helps bring out Jack Kelly's personality a bit more and he starts to mean more to you than just a pixel character on the screen, I also liked trying to make sure I could save u to $600 to pay as alimony as it gave me a chance to take bribes from people who didn't want to get a ticket and forced me to not turn away jobs I was offered from the mafia and crew. Taking on the style of 80's cop shows works well in this game, you mould Jack Kelly into the cop you want him to be, whether that's the good guy or the dirty cop his outcome is in your hands, my outcome wasn't so great I was arrested on day 20 for being a dirty cop all because I was lacking with my duties and concentrated more on helping the bad guys. 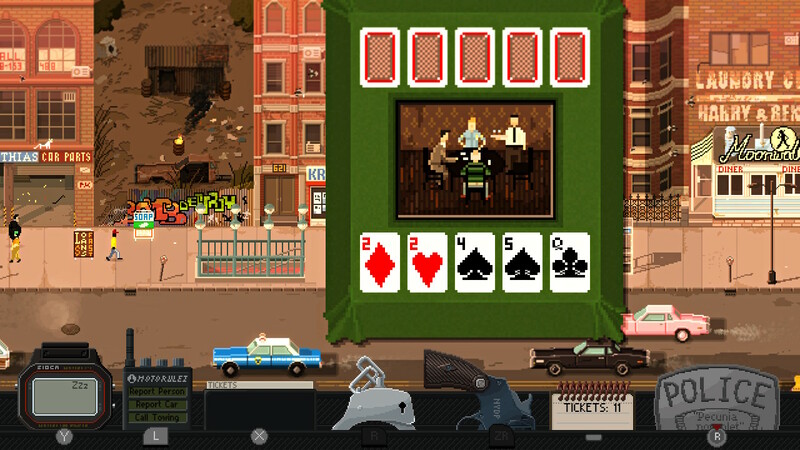 If you're looking for a multiplayer game, unfortunately, Beat Cop is single player but can still be just as enjoyable taking it in turns with one another. 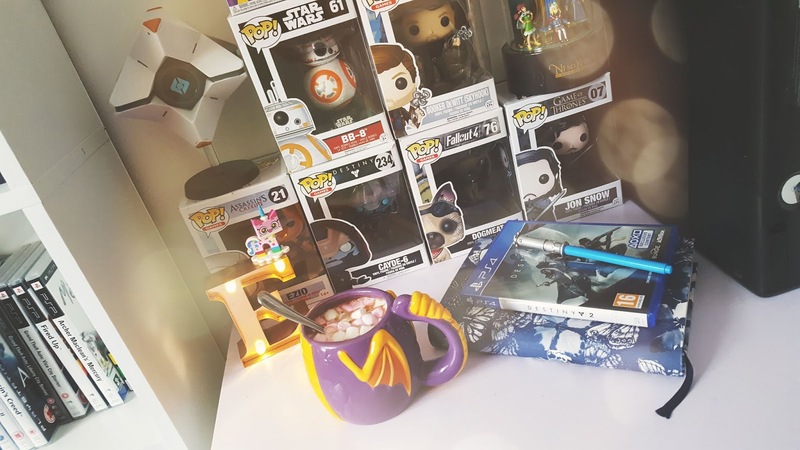 This is definitely one of them games you need to pay attention to otherwise you just end up slipping up, I want to try and reach day 21 and see what happens, hopefully, I can achieve that, overall I have given this game 5/5 because I enjoyed it so much! 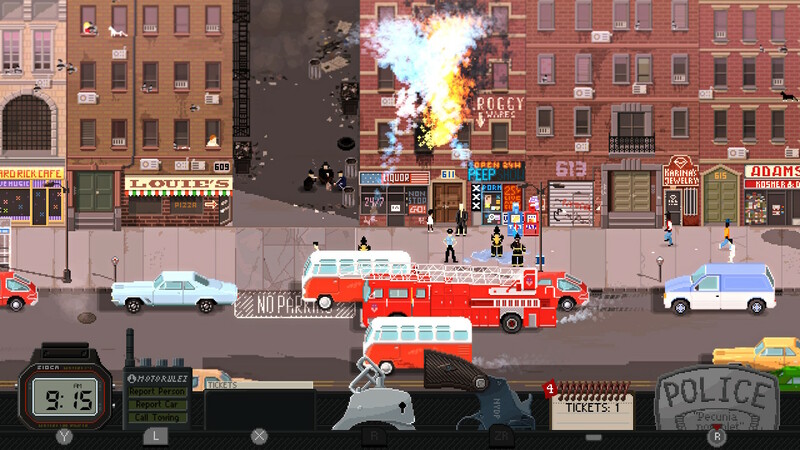 Beat Cop is available for £13.49 on Steam, Google Play, Apple, Switch, PS4 and Xbox One.